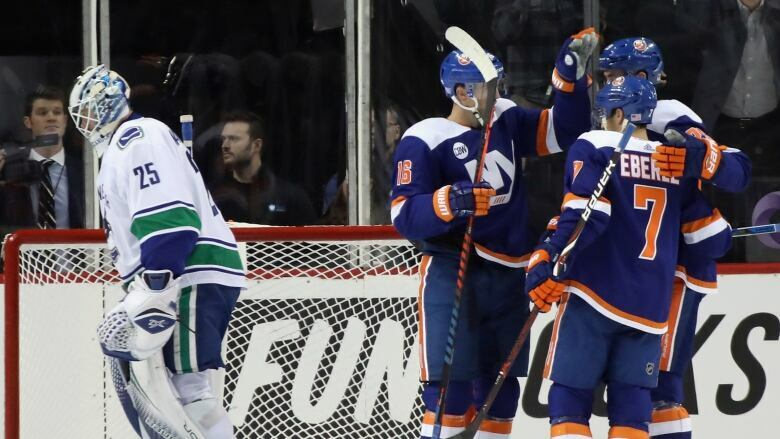 Tom Kuhnhackl scored two unusual goals to lead the New York Islanders to a 5-2 victory over the Vancouver Canucks on Tuesday night. Coming off three straight losses, the New York Islanders fell behind early. They took the lead with two quick goals and then pulled away in the third period for a confidence-building win. Kuhnhackl got his second of the game at 3:26 of the third period as Eberle's pass from the right corner deflected off Kuhnhackl's stick, a Vancouver defenceman's stick, and then Kuhnhackl's skate and in to push the Islanders' lead to 4-2. The goal stood after a video review, giving Kuhnhackl his first career multi-goal game. "I tried to spin away from the defenceman, and I thought I got tripped and they got a penalty," Kuhnhackl said, "so I just tried to throw it on net and I was fortunate enough the puck went in." New York went ahead when Bailey tried to send a pass across to Anders Lee at the right side of the net, but the puck deflected off the skate of Vancouver defenceman Christopher Tanev and in at 5:56. Barzal's assist on the play gave him 100 points for his career.